The warmth of the sun on your face. The feel of worn leather reins in your hands. The rhythmic creaking of saddle leather as your horse climbs the trail. A chipmunk darts across the trail, but your horse doesn't’t mind, he’s seen them before. The smell of sage, pine, and horses fill the air. A couple of Mountain Jays fly from tree to tree anticipating that free handout they know will be shared when you stop for a break. Spectacular views you can only imagine, until you see them from the back of a horse. Join us for an experience like no other. Join us for a Colorado high country trail ride. Not your typical stable ride, but a true back country trail ride. 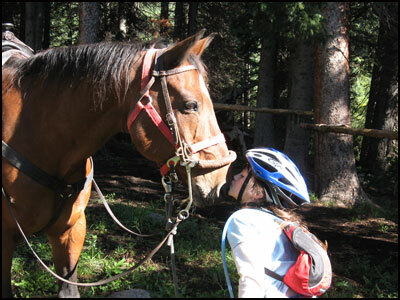 First-class horseback adventures, lead by a highly skilled and friendly guide, who is happy to share his knowledge of the area, as you ride the trails through aspens, pines, and lush mountain meadows. Everyone from six to sixty will thoroughly enjoy these trips, so bring the entire family, climb into the saddle, grab your reins and share in the experience. Since your safety and comfort are our number one priority, the horses and tack are the finest available. Our horses are experienced mountain horses with many hours on the trail, and are well trained, well conditioned, and gentle. Whether it’s your first ride or your hundredth, we’ll match your riding ability to one of our quality horses. Our saddles are padded, comfortable, and adjusted to fit each rider. We even have small saddles or buddy stirrups for the younger cowpokes. 4 hour rides depart from the Swampy Pass Trailhead located 18.5 miles up the scenic Ohio Creek Road. This leisurely ride goes to the summit of Swampy Pass, or to Willow Park where we take a break, rest the horses and enjoy the panoramic view of the Castles, north and south Castle Basins, Anthracite Range, and Storm Ridge, before returning to the trailhead. 6 hour rides also depart from the Swampy Pass Trailhead, and the possibilities for rides are endless. We can ride over the 11,000 foot summit of Swampy Pass, wind alongside the rushing waters of Pass Creek, or slip up past Bear Waller and through Middle Gate on the way to our base camp, located just a stones throw from the Castles. We’ll eat our lunch, enjoy the scenery, and rest the horses before heading out past the old historic Castle Creek cow camp on our return trip to the trail head. This ride is a little tougher and is recommended for riders 10 years and older. For those who may not have the time or calluses for a longer ride, but still want to experience the adventure of an authentic Colorado horseback ride we three hour rides from the Mill Creek Trailhead, located 11.5 miles up the Ohio Creek Road. These rides ascend from the trailhead to a scenic overlook of the beautiful Ohio Creek Valley, before traveling on to picturesque locations with spectacular views of the Mill Creek Castles. All of our rides are fully guided and include saddlebags for all your gear, and rain slickers for those unexpected mountain showers. 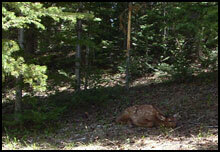 Bring along a jacket and cap, sunscreen, insect repellent, bottled water, sack lunch or snack, and a camera. You won’t want to miss taking any of these memories home. Minimum age for all our trail rides is six years. Advanced reservations are required. The best horseback rider ever into the back country! Thanks so much for having this operation, so that people like us can get away from the crazy city life and enjoy the great outdoors. We will definitely tell all of our friends.